Have you had a self-driving car encounter? Waymo car driving east on Fremont Avenue in Los Altos. I typically ride through Los Altos and the nearby hills on the weekend, and invariably I’ll see a self-driving Waymo car on the road. Should I be worried? I’m worried, given what I know now. However, five years ago when I wrote “Skidders,” a rather short novel about autonomous cars being hijacked, I was all-in for autonomous cars. I’ve had only one interaction with a Waymo vehicle. It was on a Sunday on Purissima Road in Los Altos Hills at a stop sign for Viscaino Road. The Waymo was on my right. We came to the intersection at the same time. Technically, I was supposed to yield (car on your right rule). I slowed to a near stop, but noticed the Waymo car wasn’t moving. As I started pedaling, I detected the slightest of jerks, as though the car was starting to move and immediately stopped. In a driver-controlled car, eye contact will settle who is going to go first, or a wave of the hand. But with an autonomous car that kind of communication is lost. I figure the driver behind the wheel on this occasion was waiting to see what the car would do on its own. As I rode away I wondered if I should have stopped and put my foot down. What would the Waymo car do? Farther along, the Waymo car turned right onto Arastradero Road where there was a flag man controlling traffic. I wondered what would happen if the flag man took down his stop sign for a moment, for whatever reason? What would the autonomous car do? I have heard that the Waymo cars are extremely cautious, to the point that they irritate some motorists. I looked around and found one interesting article about autonomous cars and bikes. It was written in December 2016 by Brian Wiedenmeier. He was invited to ride along in a self-driving Uber car. What he saw bothered him. The car made right-hand turns that would have threatened a cyclist’s safety. Read his article for the details. The early days of self-driving cars using the streets, without humans inside, are upon us. They’re being used, driverless, by Waymo in Arizona on a very limited basis. We know what happened with the Uber car that killed a pedestrian in Phoenix. Unfortunately, there will be more similar fatalities. A video on YouTube offers opinions by experts as to why it happened. Of course, the driver wasn’t paying attention, which didn’t help matters. All that said, I’m still optimistic that autonomous cars will make our roads safer, but it’s going to take a while. There will be problems, but they can be overcome. I’d much rather see autonomous cars on the road than distracted or drunk drivers at the wheel. My biggest concern is that all cars will have to be in autonomous mode for there to be really safe driving, like the airline industry. If you’ve had encounters with autonomous cars while cycling, let me know here. Do you think the future is bright for autonomous cars and bicycles mixing it up? It looks like the improved stretch of Bay Trail has dried out and can withstand rain without getting muddy. 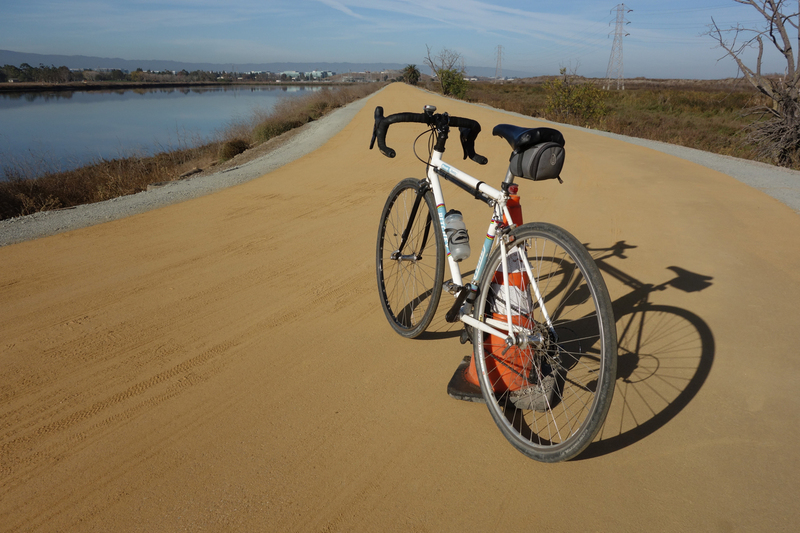 Today, after an inch of rain, I checked out the improved Bay Trail that begins near Baylands Park in Sunnyvale. I complained about the muddy conditions after last month’s rains, but it looks like the trail has dried out enough that it’s solid even after rain. I saw only one minor puddle, and the road is firm. I’m thinking that the rest of the trail to Mountain View, which runs behind the Sunnyvale water treatment plant, could easily be fixed. They just need to scrape off the gravel and roll it flat. This road is already hard-packed, unlike some of the levee roads in the South Bay that become a quagmire after rain or heavy fog. Lime ebikes parked on a quiet residential street in Sunnyvale. China goes all-in on fads, and bike sharing is no exception. 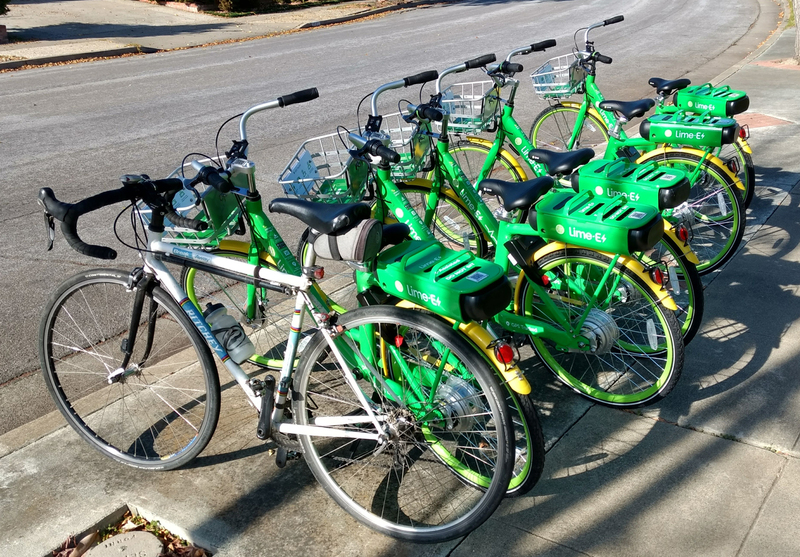 This year bike sharing has finally calmed down as millions, and I mean millions, of bikes are being removed from cluttered streets in major cities like Shanghai and Shenzhen. A regular YouTube vlogger commented on the phenomenon. The boom-and-bust business cycle of exuberant free enterprise carried to its extreme is not unfamiliar to modern China. The government leaves businesses alone, which is one reason why they have so many scandals, like poisoned powdered milk. China’s cities in the early 1980s were filled with bikes, but their numbers dwindled rapidly as the car took over. Today they have plenty of bikes, but riders stay off of the busy highways and vie for space on crowded side streets. When things got out of hand on rental bikes, the government stepped in big-time. Now China has fields of rusting rental bikes, witnessed by compelling photos on The Atlantic website. From what I’ve read, the electric bike and scooter business in China has not been so bad because the government put restrictions in place right away. We’ve seen the electric scooter business take off in the Bay Area, as well as ebikes, although it’s nowhere near as bad as in China. I ride by a cluster of ebikes parked in a residential area in Sunnyvale on Heron Avenue and it seems puzzling. There’s not much around here except single-family homes. I’ve never rented an ebike or scooter, but I suppose they do have utility for a small number of commuters in certain circumstances. 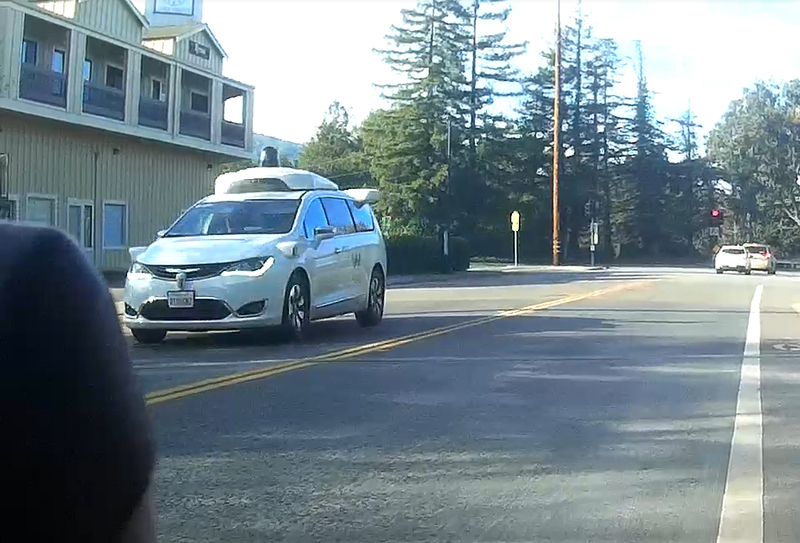 Speaking of ride-share vehicles, I came across the autonomous Waymo car today while cycling and had an interesting encounter. More on that later. 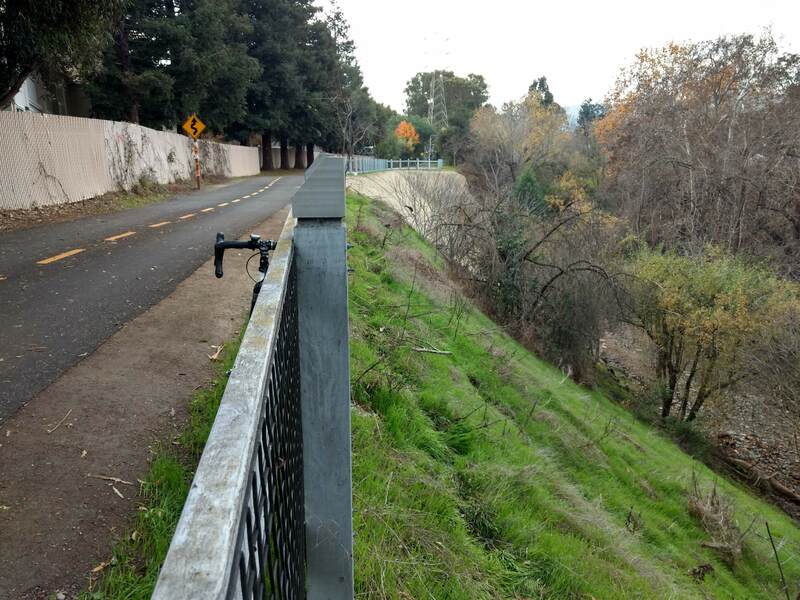 Stevens Creek Trail near El Camino Real has been fixed. It took a year, but the portion of Stevens Creek Trail damaged in the 2016 rainy season has been repaired. Heavy erosion in Stevens Creek next to the Extended Stay America hotel close to El Camino Real wiped out the paved trail. A narrow bypass trail was built. It snaked through some redwoods, which was a nuisance, especially since bikes were supposed to be walked. Of course, nobody walked. That’s the first time I’ve seen the trail closed by erosion. Back in the early 1980s, Charlie Gibson, Mountain View Parks and Recreation, showed me plans for how the trail would one day extend all the way to Stevens Creek Reservoir. At the time, there was considerable debate over finding a route beyond El Camino Real/Hwy 85. Local residents along the proposed route raised objections, of course, so the trail ends at the Highway 85 recreation path overpass. It’s an excellent overpass, one of the best I’ve ridden. I’m skeptical that the trail will ever make it to the reservoir. There’s too many houses in between and following the creek is impractical. There’s not enough space for a trail past Fremont Avenue. It’s a miracle the trail extends as far as it does. It took a lot of engineering to figure a way through all the freeways and streets. I’m amazed it came to pass every time I ride the trail. How to pay for the Bay Bridge Bike Path to San Francisco? Proposed Bay Bridge commuter path by Arup engineering. A presentation hosted by the Metropolitan Transportation Commission on November 19 in San Francisco made it clear that all the technical hurdles in building a bike path from Yerba Buena Island to San Francisco on the Bay Bridge can be overcome. It’s financing that’s the hang-up. Does anyone have $400 million they’d be willing to part with? The cost is projected to be $341 million, but that’s in today’s dollars. It will surely go up. There’s a compelling reason to build the path — traffic congestion mitigation. Rich Coffin, principle engineer with Arup engineering, said the Bay Bridge is going to be well beyond capacity in a few years. Isn’t it already? His company and city planners built the ebike into their calculations for boosting commuter traffic. Coffin revealed a compelling slide that shows how most commuters in Oakland/Berkeley/Emeryville and San Francisco could make the commute on an ebike in 45 minutes or less. The path would also be useful for doing bridge maintenance without disrupting traffic. With so many new businesses and more housing being planned, something has to be done soon. Treasure Island will have 24,000 residents by 2040. San Francisco and Oakland are growing like crazy. Right now the eastern span of the Bay Bridge has a fabulous bike/pedestrian path to Yerba Buena Island, but that’s where it ends. The western span only needed a retrofit, so there’s no bike path to San Francisco. Rafael Manzanarez, Arup bridge designer, showed the path on the north side of the span, bolted on. He said the bridge, 80 years old, cannot be welded. The added weight could lower the bridge such that ships couldn’t pass under safely. Their solution comes with a repaving project planned for the bridge, which will use lighter asphalt. The path would be 15 feet wide, with a couple feet added at the first tower, where tourists are sure to congregate. The plan calls for an off-ramp at Essex and Harrison streets in San Francisco. Bike lanes and other accommodations are planned at that location, which presently is not bike friendly. Coffin said that all ideas for funding the project are being entertained, including crowd funding and corporate sponsorship. The speakers left the impression that going with the usual local, state and federal funding sources would drag out the project beyond their 10-year plan. One audience member suggested that he would gladly pay another dollar for the bridge toll. I don’t visit San Francisco all that often, but there’s no doubt that this is a worthy project. I think of all the senseless expenditures going toward foreign wars, exotic military hardware. If you believe the projections, the path could reduce traffic on the Bay Bridge by 3 percent, at least. That sounds possible. New York City’s bridges into Manhattan have upwards of 7,000 bike commuters daily during the summer. San Francisco Bay Trail improvements are complete near Baylands Park in Sunnyvale. (UPDATE: Dec. 4): This new stretch of trail is not up to par with previous work on the Bay Trail farther west, also funded by Google. I talked with some contract workers as they were using a road roller to compact the trail some more. Based on our conversation, it was clear that they were addressing complaints. I think the issue is that the contractor used a different aggregate, sandier and more susceptible to water saturation. It’s still better than no treatment at all, but not by much. Another 0.6 miles of improved San Francisco Bay Trail is open, located near Hwy 237 in Sunnyvale. 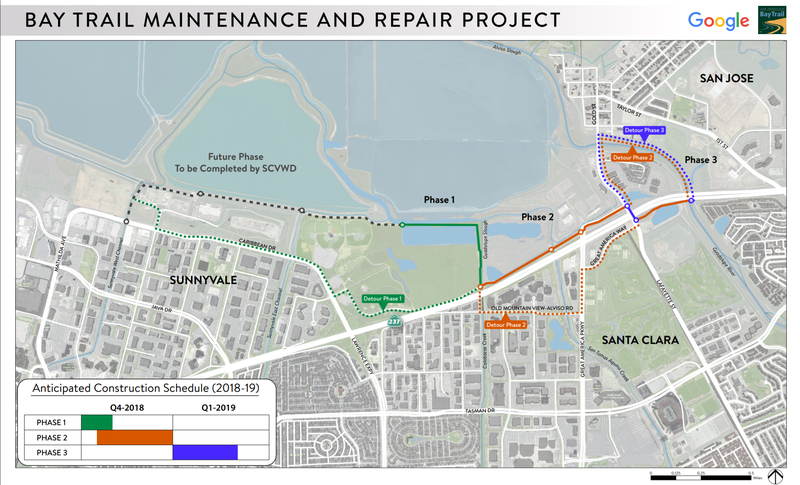 Now it’s up to the Santa Clara Valley Water District to complete the Bay Trail improvement all the way to the improved trail to the west, about a mile and a half. Phase 2 improvement was just an oil coat along the Hwy 237 frontage path. Thanks Google for funding the Bay Trail upgrade. Back in the mid 1980s, Jobst Brandt and friends worked on the road, even installing this culvert, thanks to Peter Johnson, shown riding over it. Update: At its Oct. 24 meeting, the board voted 5-0 to bid the contract to Waterways Consulting. There was no public comment. MROSD will ask San Mateo County to help pay for the trail work. At the October 24 Midpeninsula Regional Open Space District meeting, they’ll vote on approving a contract with Waterways Consulting, Inc., for design and engineering services, preparation of construction documents, permitting and bidding process support, and construction oversight for the Alpine Road Trail Repair at Coal Creek Open Space Preserve. I figure they’ll improve the “road” as a “trail,” but I can’t imagine San Mateo County would improve it to road status. It hasn’t been abandoned, but it’s a road on paper only. Of course, the study still needs to be completed, so it’s not a done deal. A lot of unknowns. The wording indicates it’s more than just a feasibility study. We’ll see. Note that this project only addresses the upper half of the road. The Bypass Trail stays. Let’s hope they fix the lower half. Anything would be an improvement, the way the trail looks now. Link to proposal in PDF. S.F. Bay Trail is being upgraded in Sunnyvale near Baylands Park. That line of dump trucks at Baylands Park in Sunnyvale, next to Hwy 237, is making improvements to the San Francisco Bay Trail, unpaved, and other trails nearby. Yves Zsutty, city of San Jose parks and recreation, said to expect some trail closures in the days ahead. See the map for alternate routes. Google is financing some of the trail improvement. The Bay Trail treatment will be the same as done for the Bay Trail to the west going to Stevens Creek Trail. Google paid for that upgrade as well. The city of Sunnyvale has no involvement. 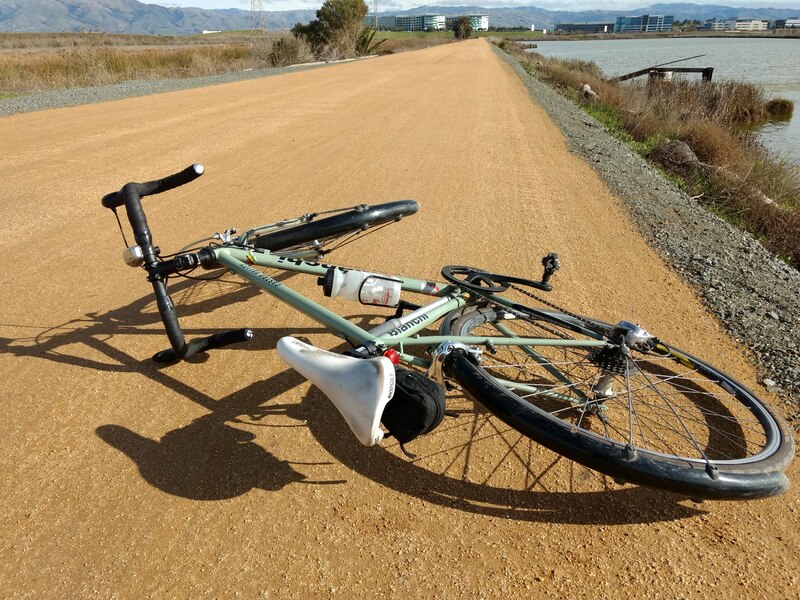 I’m not sure if the entire San Francisco Bay Trail will be improved at once. The water district is supposed to do some of the work, according to the map. 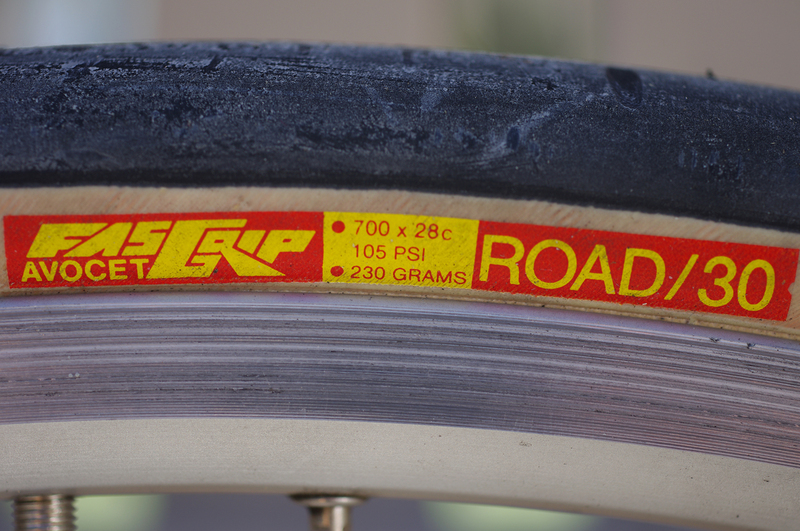 The upgrade turns a rocky dirt road into a smooth all-weather dirt path. Still dirt, but good dirt. The SF Bay Trail, Phase 1, will be open on Thursday, Oct. 25. Google inspected the upgraded trail today. Phase 2 work was underway on Wednesday, and I think it will be complete on Thursday, Oct. 25. Unfortunately, the entire SF Bay Trail to the Sunnyvale water filtration plant was not worked on, just a short stretch, Phase 1. San Tomas Aquino Creek Trail Reach 4 has been extended. Looking north to El Camino Real. For users of Santa Clara’s San Tomas Aquino Creek Trail, Reach 4 from El Camino Real south to Homestead Road is officially open. The trail will extend south to Pruneridge Avenue, eventually. From what I can see, there’s also a new sidewalk on the east side of San Tomas Expressway, pedestrians only. Anyone who rides this section of trail needs to use extreme caution crossing El Camino Real, Benton Street, and Homestead Road. Cars turning right off San Tomas might not stop. The junction at Homestead is especially inconvenient for bikes due to the curb alignment. Even with all the room taken up by the path, there’s still a shoulder where bikes can ride on San Tomas. I used to ride San Tomas a lot, but not anymore. While I’m sure some residents miss all the trees that were cut down, I don’t. They dropped needles and leaves that clogged drains on rainy days. Limbs fell down on the road, etc. Reach 4 where the road curves north of Homestead. Maybe they’ll add some landscaping later on.